We design Wedding and Event stationery, bespoke design, conduct artist workshops and classes for kids, teens and adults, and create original art and illustration. Creative director and the inspiration behind Rigby Design House based in the heart of North Yorkshire. Georgie is an Interior Design graduate from Leeds College of Art & Design. She trained as a designer for Smallbone of Devizes and many of her designs grace the homes of Yorkshire and across the north of England. From there a move into the world of television saw Georgie taking on new challenges working in the art and design departments in London, Liverpool and Leeds on popular network programmes such as Family Affairs, Brookside, Hollyoaks and Heartbeat. When she and her husband relocated to the USA, Georgie took the opportunity to join the Arts Council of Princeton and there to work with children and teens, some of whom were in care and facing great challenges. Georgie helped them express themselves through art encouraging them and helping their confidence to grow through creative workshops, camps and exhibitions, and it was while at Princeton she met Kim Moulder, Design Director for Rigby Design House. Since returning to Yorkshire, Georgie has become a mother to two (now teenage) children. 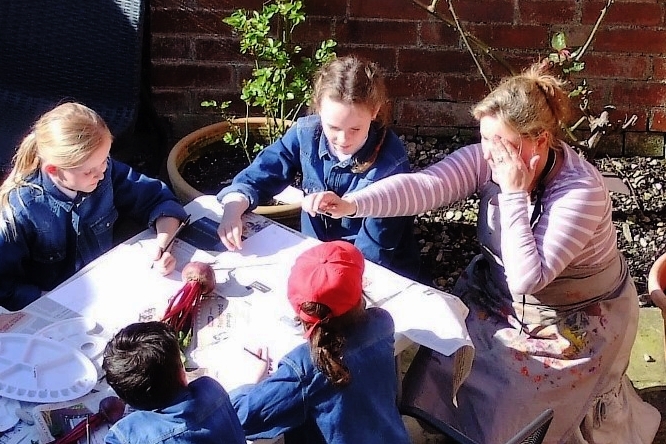 Art Workshops, Tuition and Arty Parties, inspiring the next generation of budding artists. Kim is an artist and designer based in the USA, and a graduate of Auburn University School of Fine Art. After college, she spent about ten years working as a Graphic Designer before starting a family. Since then she has worked as an artist and freelance designer creating a range of work from printed materials to website design. She continues to combine her primary art techniques including watercolour, acrylic, collage and surface pattern design with her graphic design skills and offers these works for sale online. Her art has sometimes been described as an "eclectic sophistication." Kim welcomes opportunities for licensing and her artwork can often be found exhibited in central New Jersey venues. Having been friends since their days in Princeton, Kim was thrilled to join Georgie in 2016 to collaborate on stationery design and assist with the daily design needs for Rigby Design House. The collaboration has resulted in something very special. Find more about Kim's work at www.kimmoulder.com.